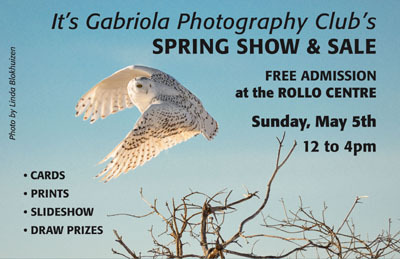 If you’re on Gabriola Island on Sunday, May 5, be sure to catch this fun, not-to-be-missed event! I’ll be there with my newest prints and cards, and look forward to seeing you. Owl photo by Gabriola Photography Club member Linda Blokhuizen. Looking ahead: I’ll be doing a solo show at Lifelabs (downstairs at the Gabriola Medical Centre) in February and March, 2020. And of course, you can find my stock photography at Alamy, 24/7!